Looking for a Soccer Personal Trainer or Camp in Connecticut? Every position and every individual athlete is unique and has specific demands. Soccer Coaches are great at teaching the fine tuned skills of soccer, but they are not qualified to know exactly how to train the body for soccer’s unique physical demands. When working with a whole team it is hard to give your soccer player the individual attention that they deserve. That is why we offer soccer specific personal training. Your athlete will get the attention they need to be able to move on to the next level. Being in business since 2002, we have created the perfect recipe to help your athlete to maximize potential! Soccer is a unique balance of physical needs. You need to have a balance of endurance; powerfully explosive bursts of speed; and the ability to change direction instantaneously. That is why we have created a system using resistance training, plyometrics, agility drills, and form drills to make sure your athlete will excel in each of these needs. 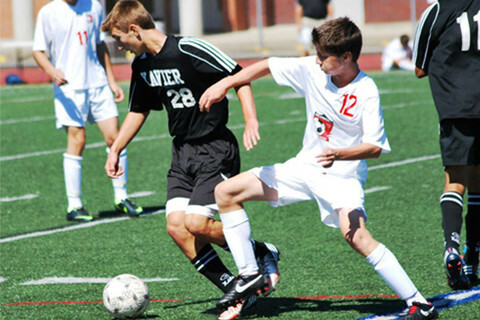 We use weight training to strengthen your soccer player in the areas that they need to succeed. We also use strength training to help correct muscular weaknesses that may lead to injuries. We use plyometrics to build explosiveness and power to help with first step quickness. And we use agility and speed drills to improve speed and change of direction. Are programs are designed to change and progress throughout the whole year. This will make sure that your athlete is primed and ready every part of the season. With this method we can work through the off-season, preseason, in-season (when performance is peaked), and the back to off-season to make sure there are optimal results. This will allow your soccer player’s next season to be their best! Looking for youth soccer camps, to build first step quickness; speed; and change of direction, in Connecticut? Get a leg up on the competition with Soccer specific Personal Training.